We are excited to be working alongside SEMrush to help marketers monitor and report their top of the funnel marketing results next to other marketing data. If you want to build an organic traffic growth machine, you can’t wait for the Google Search Console, Google Analytics or HubSpot data to roll in. We first learned about the popularity of SEMrush when we began our Agency Partner Program back in January. While agencies rely on Google and HubSpot to show middle of the funnel results, it’s hard to communicate the value of your SEO work without presenting competitor and ranking data from specialized SEO tools like SEMRush. Agencies who signed up for our program requested we create an integration for SEMrush because it tracks “the most robust set of SEO data.” They wanted to be able to communicate all of their hard work to their clients without pasting screenshots into Powerpoint. SEMRush was the key for the largest majority of them. Fast forward to August 2017: Marketers now use our SEMrush integration alongside Google Analytics, Search Console and HubSpot to better communicate the impact of their search and content marketing efforts. So, we are excited to announce our partnership with SEMrush to make it even easier to stay on top of your SEO metrics in real-time. Not only have we built an integration, but we’ll be working together with the SEO masters at SEMRush to improve it over time. Read below to see what we’ve built so far. We pull data from SEMrush’s Position Tracking and Site Audit tools, specifically. The Position Tracking tool helps you track national, regional and local search engine positions for any keyword across multiple devices. You can also use it on a competitor’s site to illustrate your competitiveness on top search terms. The Site Audit tool allows helps you to find and fix on-site issues and boost SEO optimization. It allows you to find errors, warnings, broken links and other flaws that may negatively affect your organic search rankings. 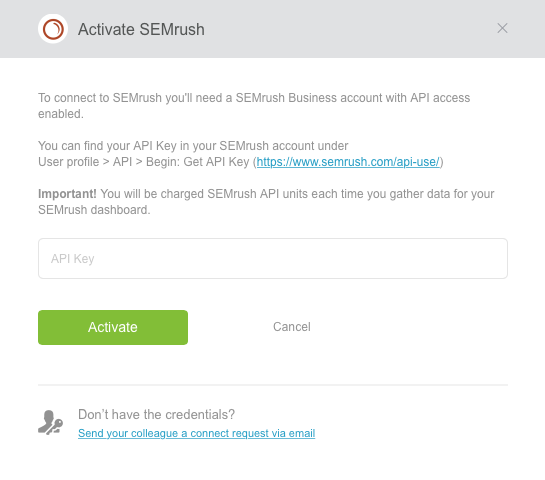 You need a Business subscription to SEMrush as well as pre-purchased API units in order to use the integration. You can connect multiple SEMrush Projects to Databox, so if you manage multiple domains or clients, you can separate the statistics for each. All you need is your account’s API key. If you need to see which data will be pulled in, check out the Position Tracking and Site Audit tools within SEMrush itself. Here are a few ways that marketers use the SEMrush integration today. 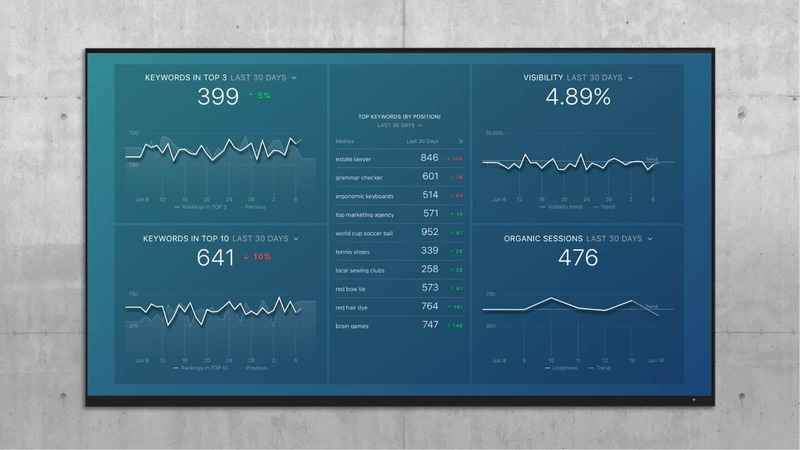 You can start using these 1-click dashboards instantly and for free. 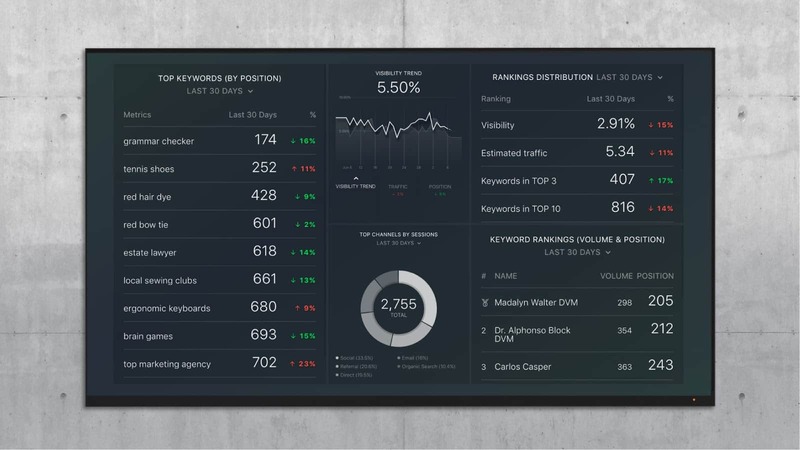 This dashboard looks at keywords where one of your pages ranks in a top 3 or top 10 position. It tracks organic traffic changes based on your ranking for these keywords. How many top 3 keyword positions does your domain hold? How many top 10 keyword positions does your domain hold? This dashboard gives you a full view of your SEO visibility as well as any challenges that crawlers face while scanning your pages. 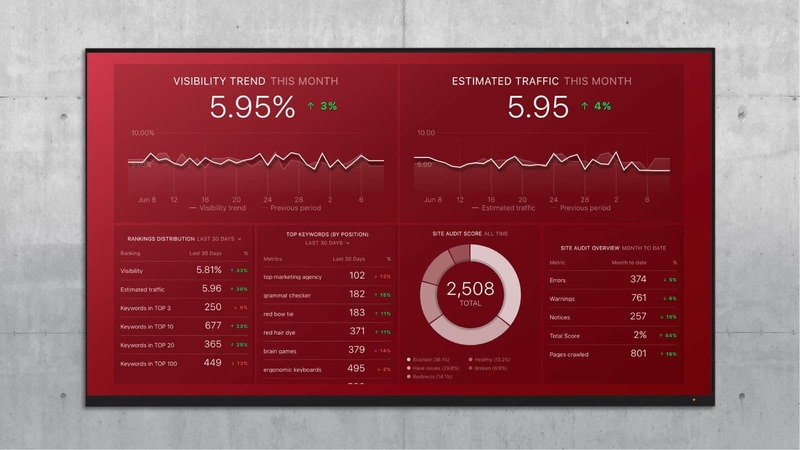 Created by Databox and SEMRush partners, Stream Creative, this dashboard is all about keywords. Track keyword ranking and changes, visibility trends to track keyword process based on CTR, plus organic search traffic monitoring. Designed to be easy for clients to read and understand. Use data to measure and monitor targeted keyword rankings, organic traffic and visibility based on CTR. Recommended for any client in a highly competitive market. Our goal is to help marketers and marketing agencies pull all their data into one spot, build views for clients or executives of just the data they need to see, track performance against goals, and instantly view all their data in a consistent format across all devices. 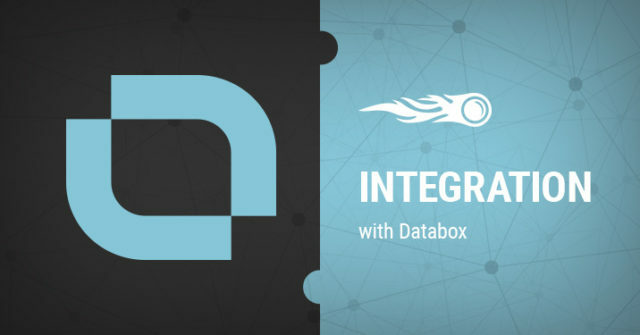 So, if you’d like to stop spending hours building spreadsheets and presentations just to communicate your marketing results, sign up to Databox to build your reporting sequence once and for all. You can even start with our generous, free plan which lets you monitor 3 data sources and build 3 reports. If you dive in and like what you see, don’t be a stranger. Unlike other dashboarding tools, we don’t stop after building a light integration. We listen to our users’ requests for pulling new metrics and build them into our product as we go. While you might find all the metrics you need already, if you want us to pull a new metric from SEMRush, please request it through our in-app support. With our relationship with SEMRush, we’re committed to building the best integration possible, so you can avoid the reporting busy work.